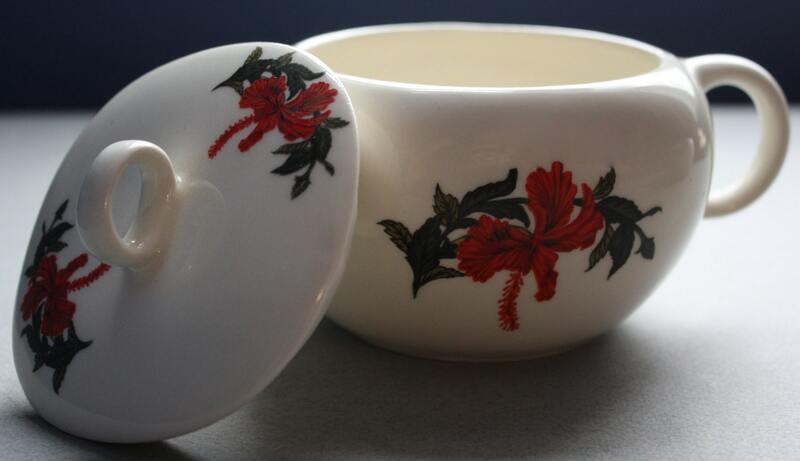 This vintage sugar bowl and creamer are from Crooksville Pottery's Iva-Lure Line. The pattern is known as Flamingo even though there is a red hibiscus with green leaves comprising the pattern. This is because the hibiscus is also known as the flamingo flower. There was an earlier, similar pattern from Crooksville's Gray-Lure line but with a beaded/hobnailed edge from the 1940s. The circumference of the creamer is almost 12.50" at the midpoint. From the spout to the edge near the handle, the piece measures 4". From the edge of the creamer to the base, the measurement is 2.75". The sugar bowl's circumference is a tad shy of 13.50" at its midpoint. From one edge to the other, the bowl is almost 3.25". From the edge of the bowl to the base, the measurement is 3". Please note the third and fourth photos. 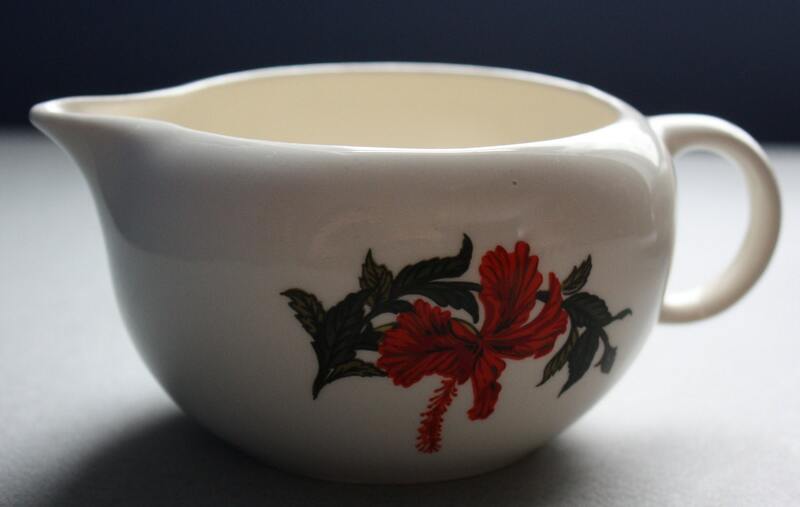 The creamer, as shown in the third photo, has a small pin prick in the ceramic. 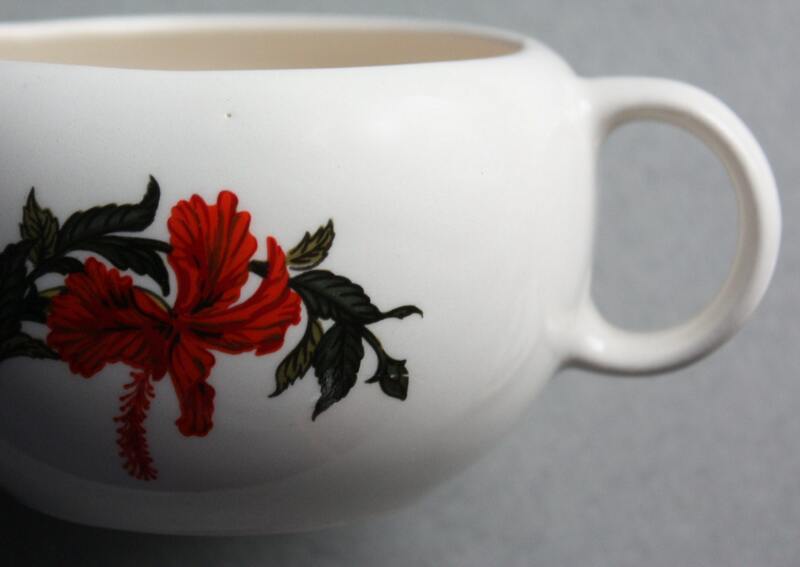 The sugar bowl, as shown in the fourth photo, has a small red mark from the paint used before the piece was glazed. I do not believe these marks are very noticeable, and I don't believe they detract from the beauty or functionality of these pieces.